If the City of Buckley, population 4,700, can comply with the state's Public Records Act, so can Washington state lawmakers. As one local government official says, "it's kind of the price of doing government." Local government officials gave state lawmakers some tough love last week, schooling a legislative panel about why it is so important to follow the state’s Public Records Act. A key take-away for state lawmakers should be this: If the city of Buckley, population 4,700, can comply with the voter-approved government-transparency law, so can the Legislature. That is a message that state lawmakers have long needed to hear. In February, the vast majority of them voted to exempt themselves from Washington’s Public Records Act. The law, which Washington voters originally approved in 1972, is perhaps the single most important tool for ensuring Washington citizens can keep watch on government officials. The Legislature’s public-records vote was especially infuriating because it came a month after a Thurston County judge ruled lawmakers had been illegally withholding government documents — including their emails, calendars and disciplinary records — from the public. Gov. Jay Inslee eventually vetoed the legislative-secrecy bill, Senate Bill 6617, at the request of more than 20,000 citizens who contacted his office. But the debate is far from over. The Legislature is now appealing the Thurston County ruling, which came in response to a lawsuit brought by 10 media organizations, including The Associated Press and The Seattle Times. The state Supreme Court is expected to hear the case in coming months. Meanwhile, the Public Records Task Force — formed in the wake of Inslee’s veto — is developing recommendations on how next year’s Legislature should approach the issue. It is crucial that legislators stop focusing on their longstanding reasons for skirting the law and instead brainstorm ways they can start following it. Yet so far, progress appears glacial. One lawmaker, state Sen. Curtis King, R-Yakima, said at last week’s task-force meeting that he had “no qualms” about why he voted for the bill that Inslee then vetoed. Other legislators would not commit to the general idea they should follow the same rules as other elected officials — even if the Public Records Act were amended slightly to address some of their concerns. When asked that question directly, state Rep. Larry Springer, D-Kirkland, gave a remarkably evasive response. “It’s perhaps a little binary to simply answer the question: Should you be subject to the Public Records Act, or not?” said Springer, who co-chairs the task force. “I think a more important question is, in an effort to be as transparent, as open, as possible, are there things we need to change in the way in which we deal with information at the Legislature? “Whether that is a blanket application of the Public Records Act or not, I think is a question that remains to be asked,” he continued. The Public Records Task Force has one more meeting to get it right before it is supposed to finalize its recommendations to the 2019 Legislature. 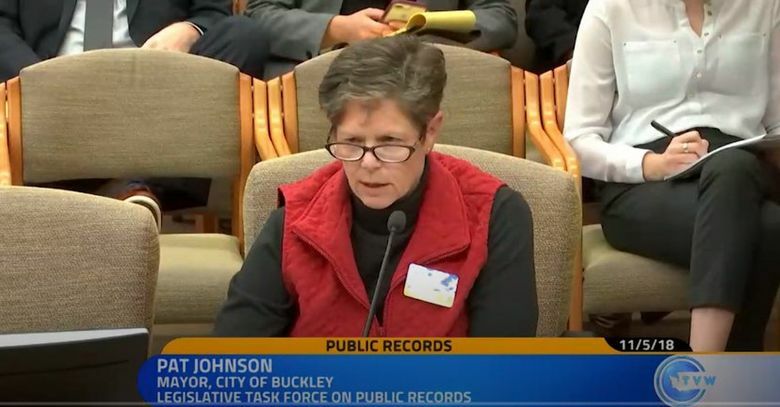 Between now and then, legislators on the panel should strive to think more like Johnson, the Buckley mayor, who sees following the Public Records Act as an important obligation to Washington citizens. “That Act is key to building and retaining public trust in government — especially now, when there is so much distrust in what we are doing,” Johnson said. Lawmakers, you should be taking notes.